Garrett K. Scanlon is a 25-year real estate veteran who, for years, has helped agents and brokers take control of their life with a simple, workable plan. 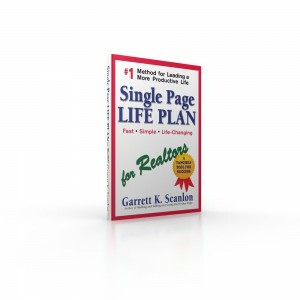 Single Page Life Plan for Realtors is a tangible life-planning tool for winners who wake up every January 1st knowing that, in the unstructured world of real estate, it is up to them to map a course of action for a successful year. This book includes everything found in Garrett’s book, Single Page Life Plan, plus a conversation on what all great real estate professionals have in common. It also includes Single Page Checklists for real estate sales and multifamily investment. “Priorities must earn their way to page one!” Your plan will help you focus on meaningful activity, reduce stress, and add spontaneity to your life. You will design a plan that is tailored to your unique skills, talents, and interests. A plan that resonates with you! SIMPLIFY YOUR LIFE! Once a life plan or a business plan spills onto a second page, it is filed away, never to be seen again. 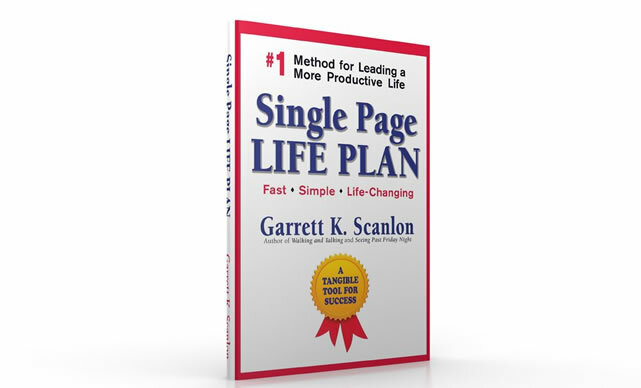 Single Page Life Plan for Realtors solves that problem by putting a simple plan at your fingertips. Included, is a ‘tear out’ template of a Single Page Life Plan for Realtors that you can use, along with brainstorming ideas throughout the book, to make your plan 100% personal to you! START TOMORROW TODAY, and enhance your real estate career with your own Single Page Life Plan for Realtors! When you buy a copy of the book you are starting tomorrow today! Send the priorities of your life to page one!